This is so simple. I took this recipe and I adapted it. It made a light, fluffy bread that was more suited for breakfast than dessert. Exactly what I was going for. 2 cups Bisquick, 2 eggs, 2 t. vanilla, 1/4 cup apple butter, 2 T. canola/vegetable oil, 2 mashed bananas. Stir in Bisquick and bananas until well-combined. Bake at 350* for 30 minutes. 3. Fred Meyer knows me all too well. They've been tracking my purchases via my rewards card...and then sent me some coupons for the only things I buy there. 4. We started Season 1 of Homeland over the weekend. We've been making our way through it, but (but, but, but!) I am too in love with Weeds to focus on anything else. I can't even close this with "I'm so exciting, right?" because, really, for me, this actually is excitement. 5. I changed my About Me page. 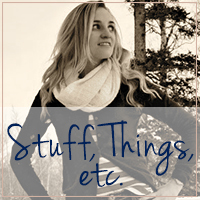 I think every blogger needs an About Me page, but lately, I am also of the mindset that simpler is better. Which leads me to...is there anything YOU'D like to know about me? Anything I haven't yet divulged? Sharing at High Five for Friday. 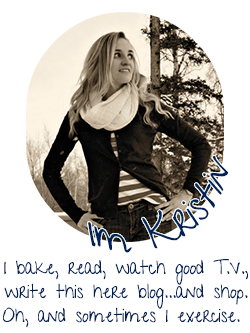 I should simplify my About Me page too! i love your yellow pants!! and chris and i need a new show to watch - i've heard about homeland - do you like it a lot? Love the yellow pants and I tried to watch Homeland as well but I'm obsessed with White Collar so I know how it is to not be able to focus haha. Pants = awesome. Any comments at school on those?? I need to check out Homeland...and about 30 other shows. Darn not having cable!!! Your new about me page is great, too! Homeland is the best!! You are going to be hooked if you arent already! I am LAME. I don't know how to create an About Me page. I should really investigate it. It's been on my To Do list. I wish every place I shopped sent me coupons for the products I buy most. That would be awesome! So, if you got to CHOOSE where the Army sent you, where would you want to live?? Also, HOMELAND, yes yes yes. I loved it. Those pants... I totally support the neon pant movement! When are you going to have a baby? Do you have a new teaching job lined up or will you be subbing? If you could teach any grade what would it be? Love that banana bread recipe, I'm totally trying it. :) I hope you had a good weekend!